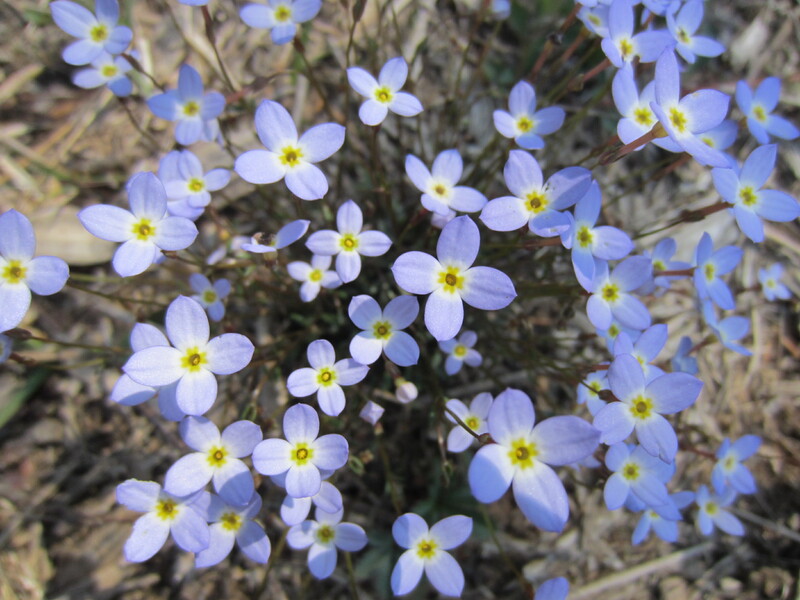 Saw this tiny wildflower growing down by the creek. Teeny-tiny blossoms. It is about 4″ tall. 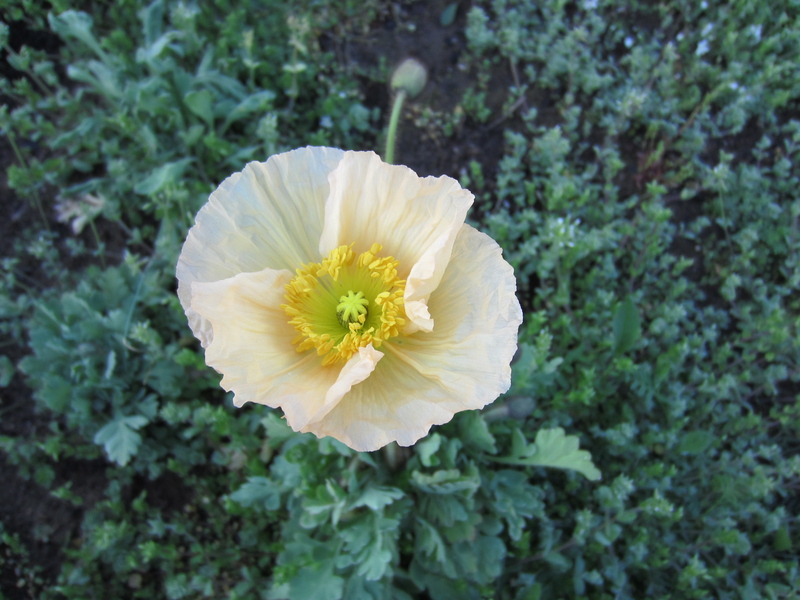 Our first Papaver nudicaule (Iceland poppy) bloomed last week. Beautiful! I wish we had a whole field of them. We finished our shiitake project. These two little stacks don’t look like much, but they represent quite a lot of time! 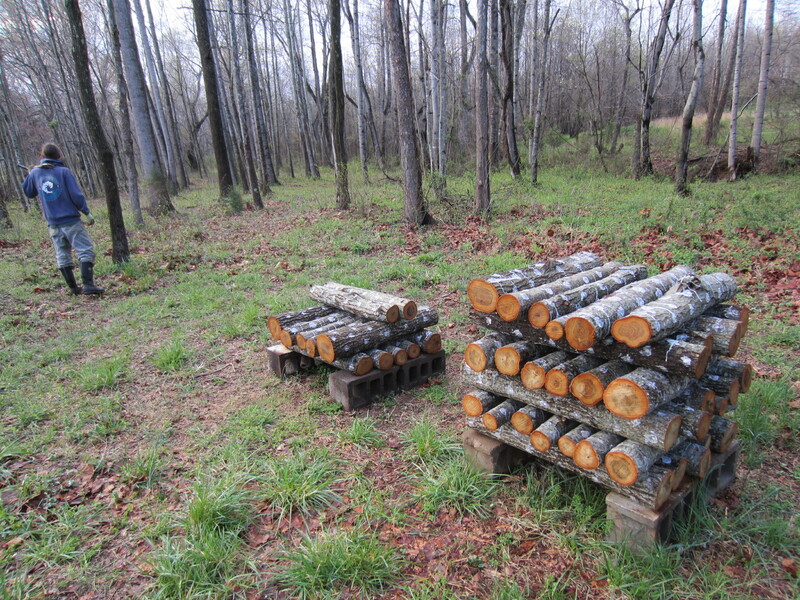 We ended up with 47 logs inoculated. 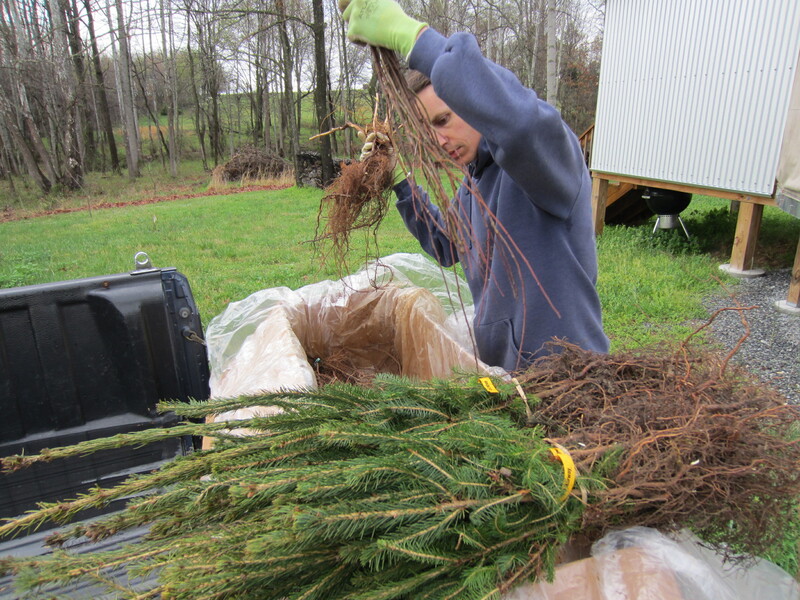 Planted over 100 bare-root trees around the farm on Sunday. Norway spruce, common apple, common pear, persimmon, bald cypress, sugar maple, and plum. I should say, Gavin planted them. 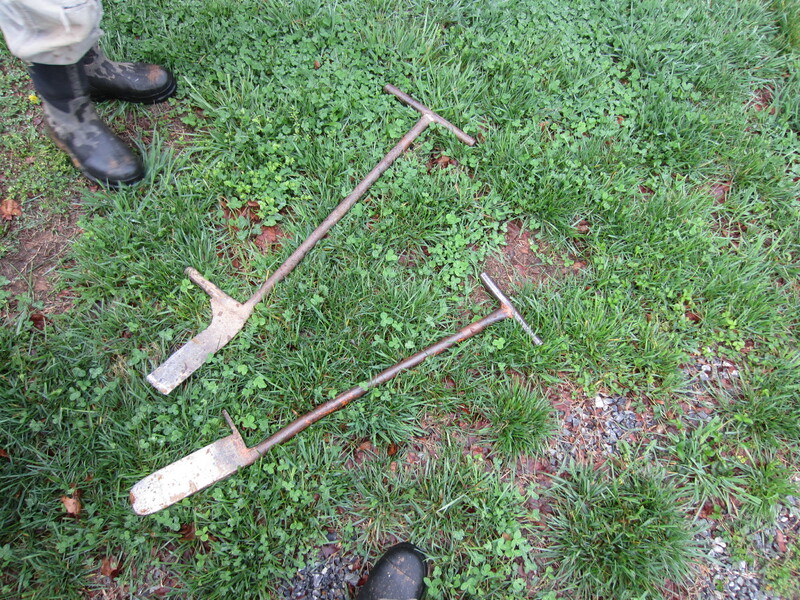 These are tools for tree planting. 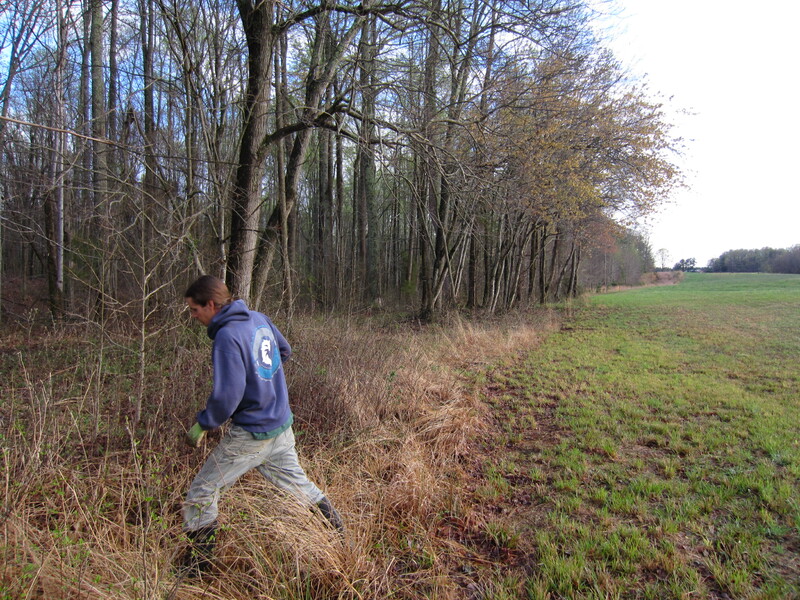 Most went into the brushy area between the woods and creek on the edge of the field. We hope someday we will look out and see these trees blooming and bearing fruit! Most likely the animals will get to them first. 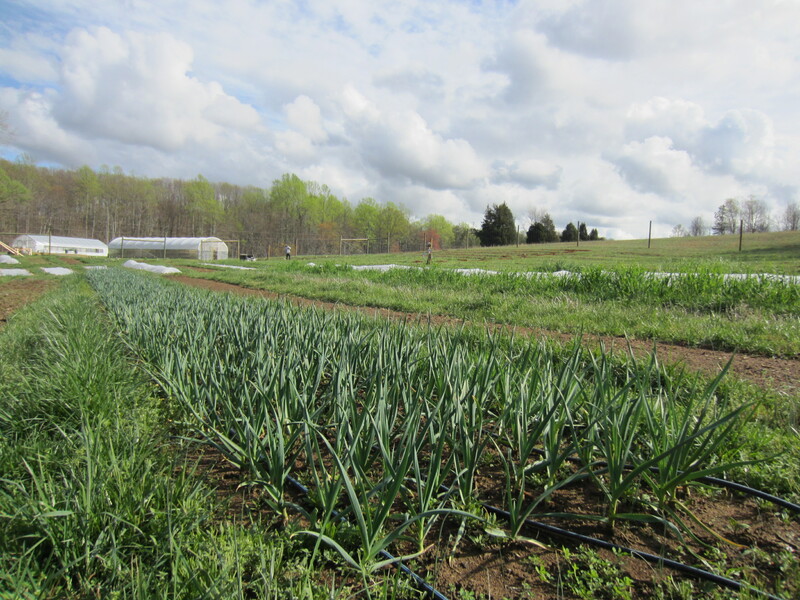 The common varieties are probably not delicious eating, but we could preserve them. 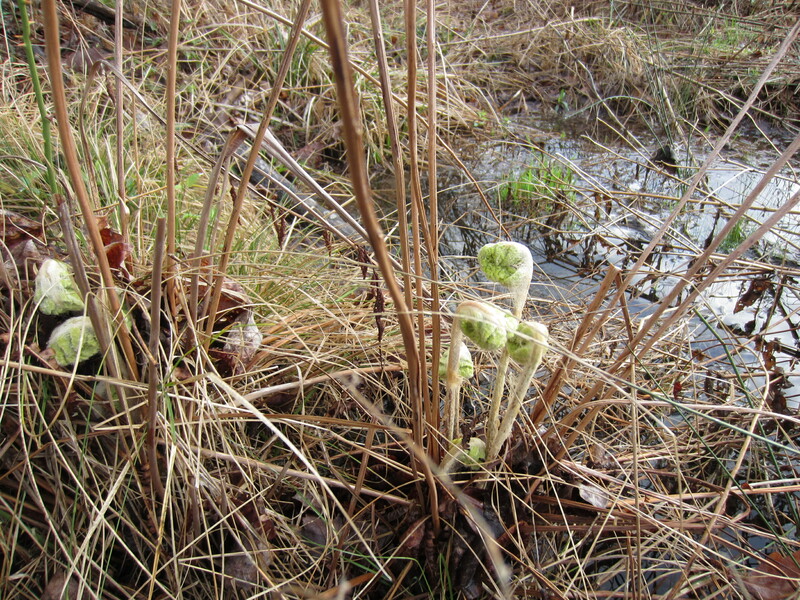 We planted the bald cypress trees in the swampy area that is created by a spring and the creek coming together. Bald cypress trees are deciduous conifers. In Virginia they are typically found in the Tidewater area. We hope they will do well in our Piedmont location. According to the USDA map, their native habitat extends as far north as southern Delaware and southern Illinois, so they should be fine here. 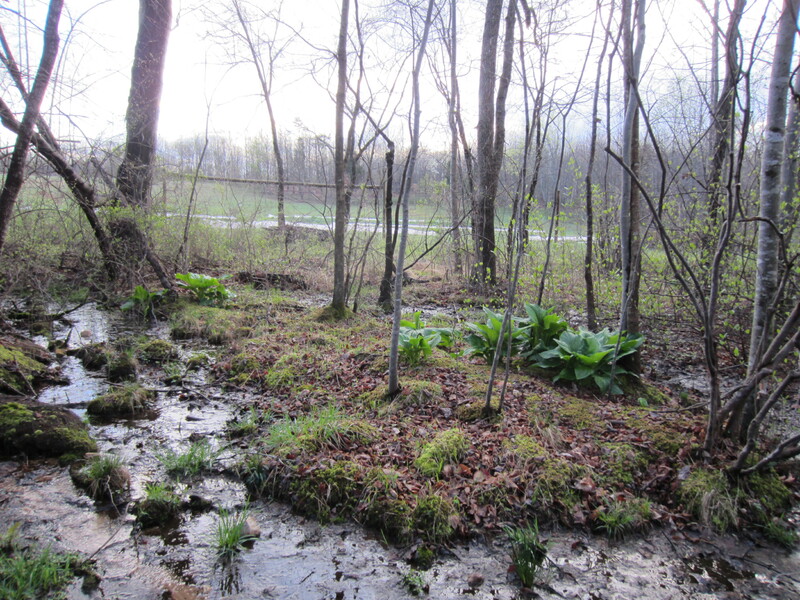 They grow in standing water. 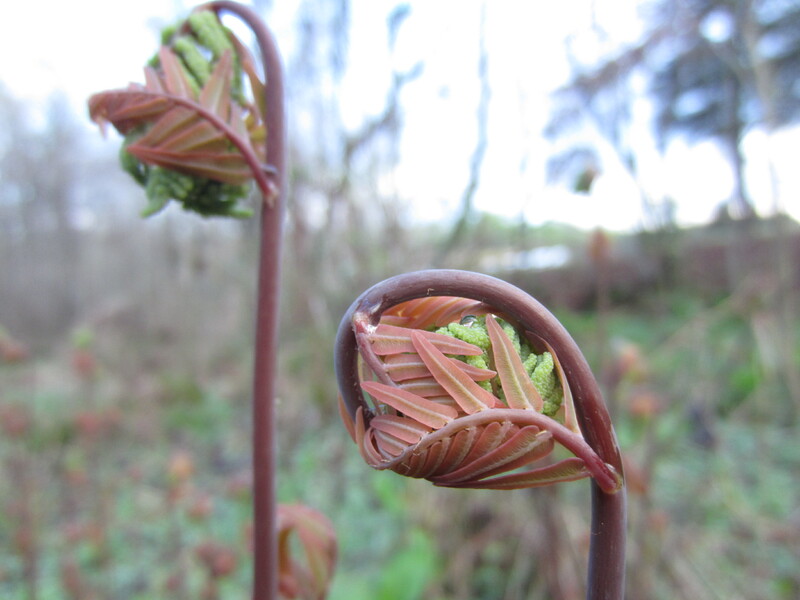 Another type of fern unfurling. The plantings I made two weeks ago are already visibly growing! 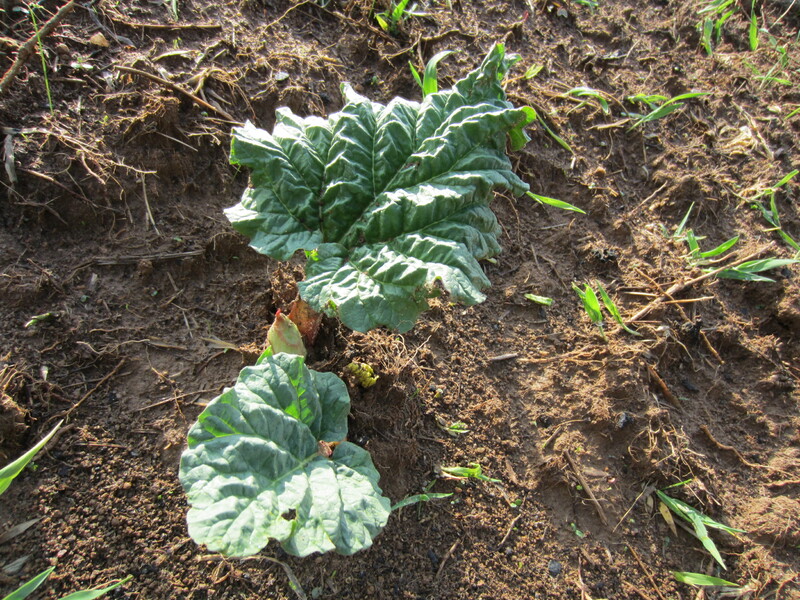 I could not believe how fast the rhubarb poked up out of the muck. 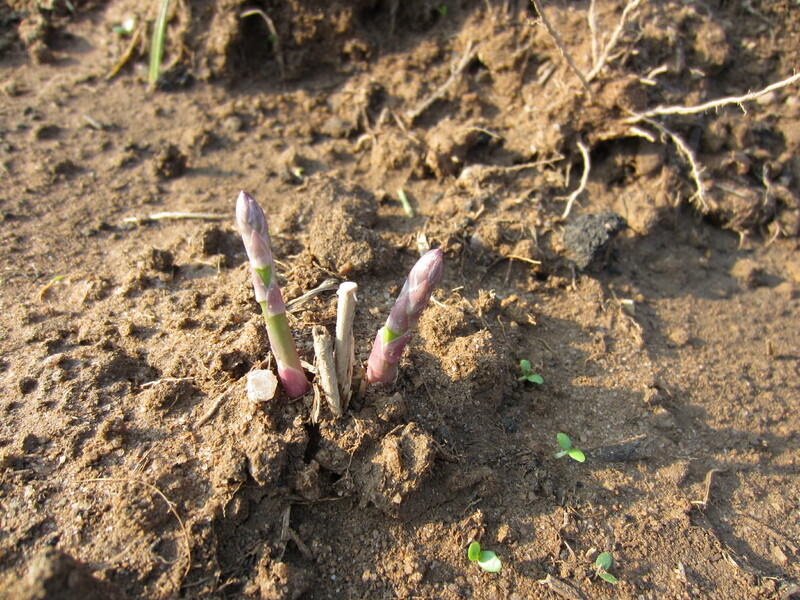 The asparagus were growing practically the day after I planted them. I wish everything grew this fast. They are two feet tall now! 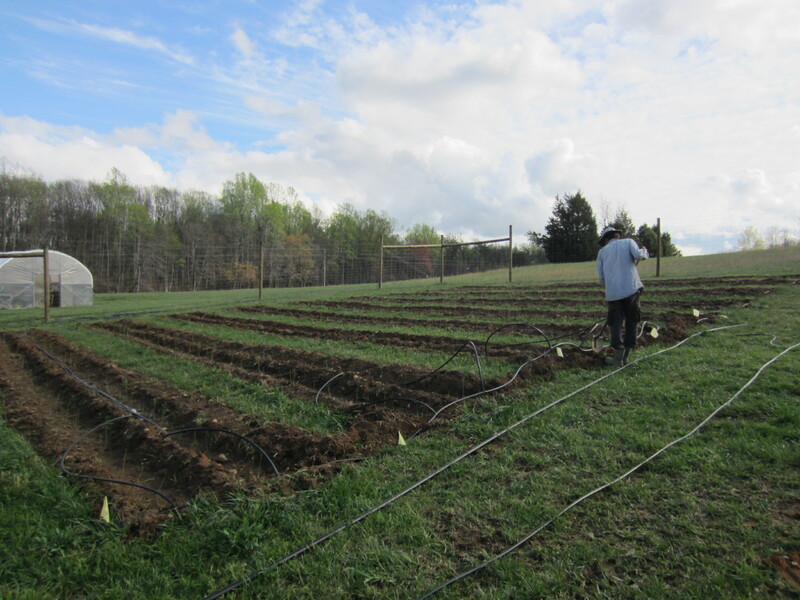 Gavin worked on putting in the irrigation for the asparagus and raspberries. 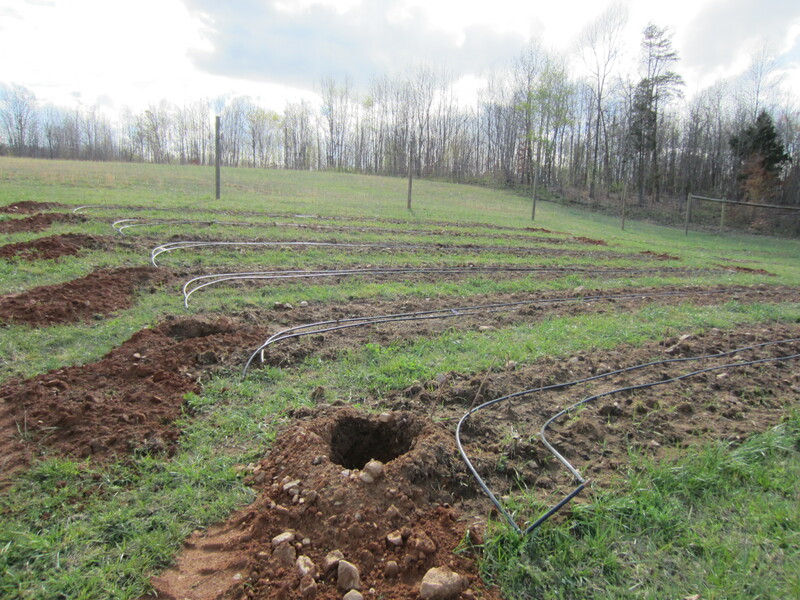 Our plumber came on Friday and dug trenches to expand our irrigation system into the new growing field. Now we have water hydrants in the field outside the fence as well as in the new high tunnel. He used an auger to dig holes for the raspberry trellis posts. This will save Gavin a lot of time digging! In the field, garlic is growing well! I have been busy planting, planting, planting. Only four more weeks until the first market! 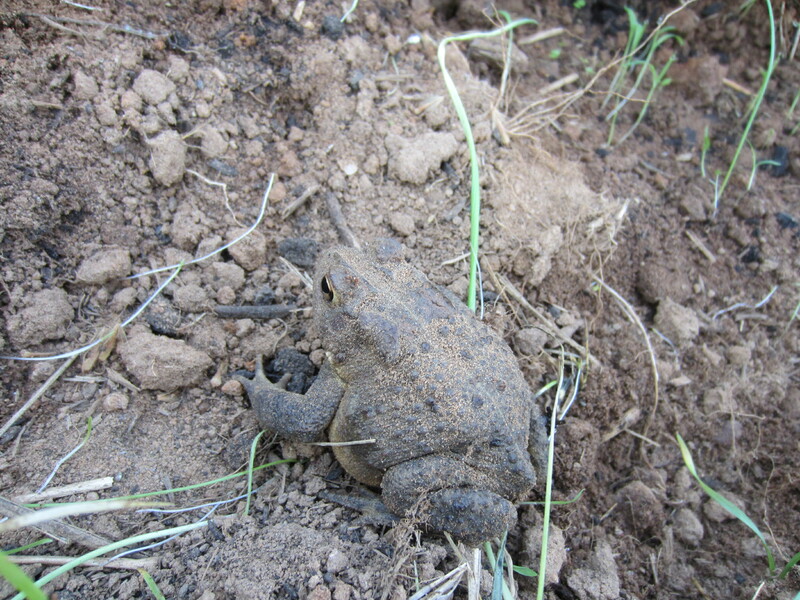 Saw a toad living in the high tunnel. I almost stepped on her: she is so well-camouflaged. 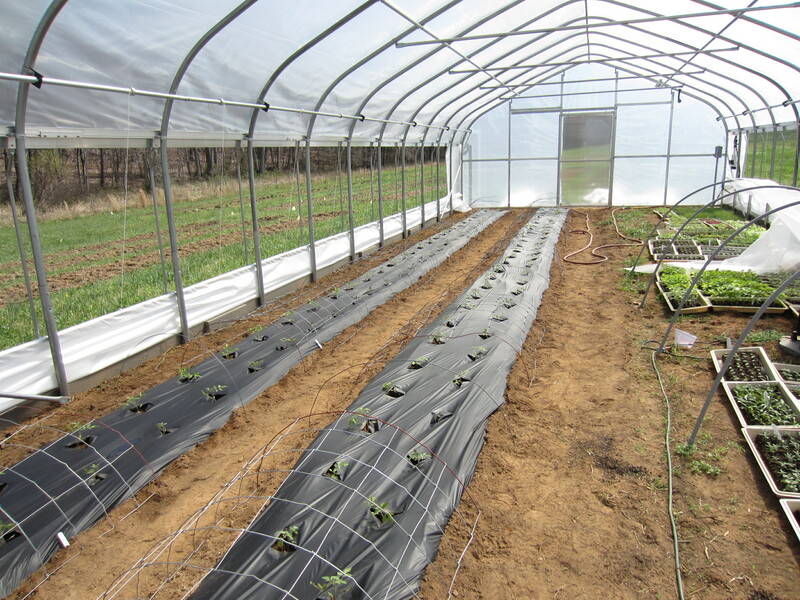 We got the high tunnel half-planted to tomatoes. We still need the other half for our seedling trays, but it will eventually be planted to peppers and ginger. It took a whole day to prepare this area and plant. 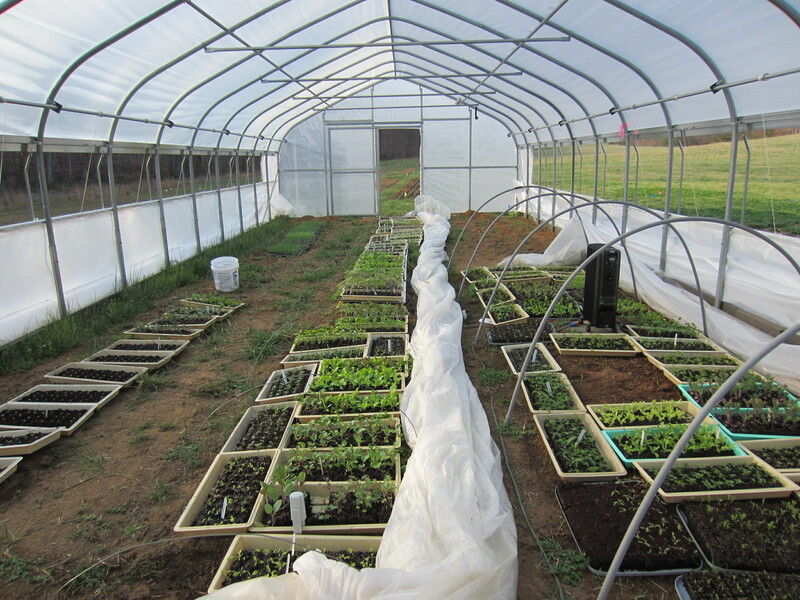 Move the trays, remove weeds and sticks, put down compost, lay out rows, till, rake up, put down plastic mulch, plant, and cover with hoops for row cover! It was raining but we still got some work done! Had our first frost in weeks Monday night. It feels like spring again. So many projects going on all at once. Looks like you are making great progress. Hope that was the last frost. We are sure to get more frost, unfortunately. Just when we think it is safe to plant out those summer crops it will sneak up and freeze again.